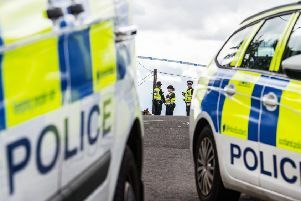 A Bo’ness man burst into his estranged wife’s house - and slashed a Welshman he found in her bedroom. Falkirk Sheriff Court heard today (Tuesday) how Leigh Barkham’s victim escaped in his bare feet - but was left trying to flag down cars when he had no idea where he was. The incident took place last, after Jason Kelly (32) met Barkham’s wife in the Richmond Park Hotel. The court heard that Barkham (36) and his wife had separated a few months earlier after 16 years of marriage. Mr Kelly, a paint-sprayer from Newport, Monmouthshire, and Ms Barkham “began chatting to each other”, and she “invited Mr Kelly back to her home address”. The court was told that “on arrival they went directly into the bedroom”. About 11.50pm, her mobile began ringing, and she noticed she had nine missed calls from Mr Barkham. Thinking it might be an urgent matter concerning their daughter, she rang him back, but he immediately started asking what she was doing and who she was with. She warned Mr Kelly to hide in her wardrobe, and then opened the front door, still concerned about their daughter. Samantha Brown, the depute fiscal, said Mr Barkham “pushed past her into the house and went straight into the bedroom”. Mr Kelly, who was sitting on the end of the bed, saw a knife, and put his arms up to defend himself. He then felt what he thought was a punch. He escaped into the street in his bare feet, “trying to orientate himself”. He tried unsuccessfully to flag down several cars without success, before realising he was bleeding heavily. He took off his T-shirt to try to staunch the blood, and phoned a work colleague, who managed to find him and take him to hospital. Doctors found he had a “significant facial slash above the left jaw line, consistent with a knife injury”. Ms Brown said he had been left with a “substantial scar”, suffered flashbacks, and was now fearful of going into pubs. After the incident Ms Barkham called her brother-in-law, who went straight to her house, while Barkham made yet another phone call, this time telling his estranged wife, “You have broken my heart”. Police found “a trail of blood leading from the property” and arrested Mr Barkham at his home, five minutes walk away. Mr Barkham pleaded guilty to assaulting Mr Kelly to his severe injury and permanent disfigurement in the incident on June 2, 2017. Sheriff John Mundy deferred sentence until February 22 for pre-sentencing reports.